Illinois point guard Tracy Abrams will miss the 2015-16 season after suffering a torn left Achilles tendon during Monday’s practice, the school announced Tuesday.Abrams also missed all of last season with a torn ACL. Abrams started 19 games as a freshman in 2011-12, then averaged 10.6 points and 3.5 assists as a sophomore, then 10.7 points and 3.2 assists as a junior. The 6-foot-2 Chicagoan was a consensus top-75 national recruit coming out of high school. 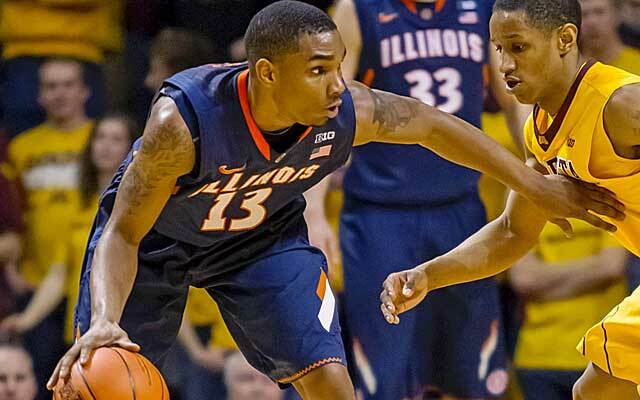 He has averaged at least 28 minutes per game in each of the past two seasons he’s played with the Illini. How bad is Bettman’s Salary Cap for Stanley Cup Champs, LIKE THE BLACKHAWKS? When veteran defenseman Johnny Oduya signed a two-year contract with the Dallas Stars this week he became the sixth different player to leave the Blackhawks this summer after playing in the Stanley Cup clinching game. He joined a list that already included Brad Richards, Antoine Vermette, Patrick Sharp, Kimmo Timonen and Brandon Saad. Some of them left as free agents, some of them were traded, one of them (Timonen) retired.It’s a significant chunk of the roster to replace (30 percent of the players that were in the lineup that night) and it was almost entirely because of financial reasons, something that just about every Stanley Cup winner eventually has to deal with in the salary cap era.But how does that roster turnover compare to past winners?To compare, I went back over the past 10 Stanley Cup winners (all in the salary cap era) and simply looked at how many players that were in the lineup for the Cup-clinching game ended up playing for different teams the next season. The average roster turnover for Cup winners: 3.3 players.The only teams that lost more than five players were two of the past three Blackhawks teams. Here is the complete breakdown. 2014-15 Blackhawks (6 — so far): Brandon Saad, Patrick Sharp, Johnny Oduya Brad Richards, Antoine Vermette, Kimmo Timonen.Those six players combined to score 53 goals (mostly from Saad and Sharp) for the Blackhawks during the regular season in 337 man-games with the team.With the Blackhawks still dealing with the salary cap crunch this list could continue to grow and perhaps include Bryan Bickell or Kris Versteeg. 2013-14 Los Angeles Kings (1): Willie Mitchell.The veteran defenseman was the only player to leave the team following the Kings’ second Stanley Cup win in three years, signing a free agent contract with the Florida Panthers. 2012-13 Blackhawks (3): Dave Bolland, Viktor Stalberg, Michael Frolik.Stalberg and Frolik left via free agency while Bolland, just days after scoring the Cup-clinching goal late in the third period of Game 6 to complete a wild comeback, was traded to the Toronto Maple Leafs for two draft picks. He would spend one season in Toronto before signing a huge contract with the Panthers the next offseason. Those three scored 19 goals in the lockout shortened season for the Hawks. 2011-12 Los Angeles Kings: (0): Every player in the lineup in their Game 6 win over New Jersey returned the next season. 2010-11 Boston Bruins (3): Tomas Kaberle, Michael Ryder, Mark Recchi, who was 42 during the season, retired after an incredibly successful career that saw him win three Stanley Cups with three different teams and score 577 goals. Ryder moved on as a free agent and signed with the Dallas Stars where he would score 35 goals the next season, while Kaberle, who was a trade deadline acquistion signed with the Carolina Hurricanes where he was a pretty big disappointment. 2009-10 Blackhawks (8): Dustin Byfuglien, Kris Versteeg, Antti Niemi, Andrew Ladd, John Madden, Brent Sopel, Ben Eager, Cristobal Huet. The original salary cap crunch with the Hawks was massive and saw the team lose several key players, including both goaltenders and a significant chunk of their forward depth with Byfuglien, Ladd and Versteeg all getting traded in the days after their Cup win. That group combined to score 72 goals in 494 man-games during the 2009-10 regular season, and even though Versteeg eventually returned to the Blackhawks (and is still a member of the team today) Ladd has gone on to become the captain of the Winnipeg Jets while Byfuglien is one of the most productive defensemen in the league. 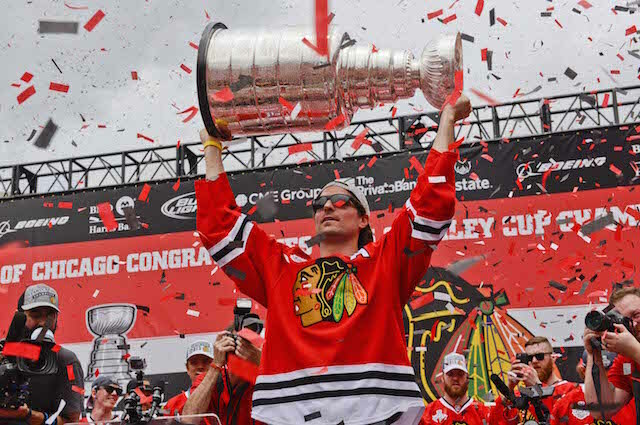 Another important piece of the Blackhawks‘ last two Stanley Cup titles is on his way out of town. Unrestricted free agent defenseman Johnny Oduya, who won the Cup in 2013 and 2015 with the Blackhawks, confirmed through agent Don Meehan that he will not be returning to the club according to multiple reports.Oduya’s new team is expected to be announced today according to Brian Hedger of NHL.com. It is believed both the Dallas Stars and Buffalo Sabres were among the teams in pursuit of his services.Oduya had reportedly been waiting to see if the Blackhawks could resolve their salary cap issues to fit him in, despite being among the top defensemen on the free agent market.The 33-year-old blueliner had 10 points in 76 games with the Blackhawks last season while averaging 20:17 per game. 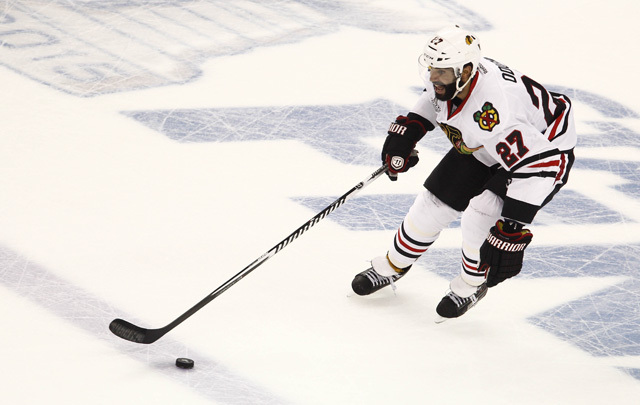 He also notched five assists during the team’s Stanley Cup run, while averaging nearly 25 minutes per game, as the Blackhawks dealt with limited defensive depth.Oduya spent parts of four seasons with the Hawks after being traded from the Winnipeg Jets late in the 2011-12 season for a pair of draft picks.A veteran of 664 NHL games, Oduya also spent time with the New Jersey Devils and the Atlanta Thrashers before the team moved to Winnipeg. He has 152 career points and has average top-four minutes throughout his career.The Swedish rearguard joins a long line of players from this year’s Stanley Cup team headed out of town. Brandon Saad and Patrick Sharp were both traded away, while Antoine Vermette and Brad Richards left via unrestricted free agency. Additionally, Kimmo Timonen retired. 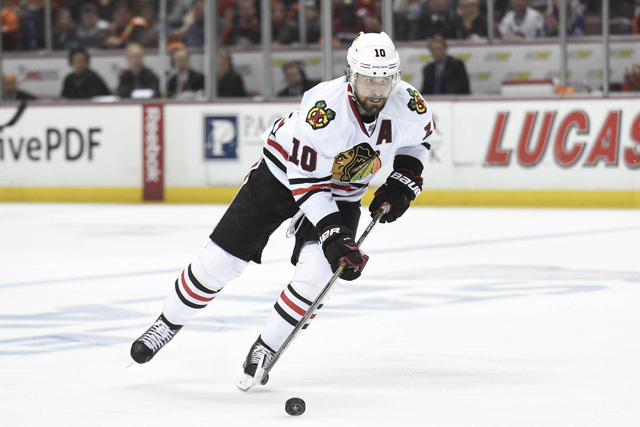 There are other moves expected as well, as Hawks remain in a salary-cap crunch. Sharp latest “cap” victom, sent to Dallas. Given their salary cap situation it was simply a matter of when, and not if, the Blackhawks were going to trade veteran forward Patrick Sharp this offseason.On Friday night they finally did it.The Blackhawks sent Sharp and defenseman Stephen Johns to the Dallas Stars in exchange for defenseman Trevor Daley and forward Ryan Garbutt.Sharp, 33, still has two years remaining on his current contract that pays him an average of $5.9 million per season. Together, Daley and Garbutt will count $5.1 million against the cap over the next two seasons. When you factor in the $800,000 Johns would have made on the NHL roster, the cap savings come out to around $2.5 million for the Blackhawks.Even with that savings, the Blackhawks are still only a little more than $980,000 below the league’s salary cap ($71.4 million) for the upcoming season with only 21 players under contract, via General Fanager.They still have to re-sign restricted free agent Marcus Kruger and were still interested in bringing back veteran defenseman Johnny Oduya, though the addition of Daley could certainly impact that.Sharp scored 16 goals and recorded 27 assists for the Blackhawks in 68 regular season games this past season. He had been with the team since the middle of the 2005-06 season when he was acquired in a trade from the Philadelphia Flyers and was a core player on a Blackhawks team that won three Stanley Cups in six years.He is no longer in the prime of his career, obviously, and his production started to drop a bit this past season, but he is still an extremely productive player that should prove to be a huge addition in Dallas. He is now joining a Stars team that was already one of the best offensive teams in the league, finishing the 2014-15 season by averaging 3.13 goals per game, the second highest mark in the league behind only the Tampa Bay Lightning.Along with the Sharp, the Stars also have the Art Ross Trophy winner (Jamie Benn), Tyler Seguin, Jason Spezza and Valeri Nichushkin in their top-six. Adding Sharp to that mix is only going to improve their chances of rebounding from what was a disappointing 2014-15 season.They also looked to upgrade their goaltending this offseason by bringing in former Hawk Antti Niemi to form a veteran duo with Kari Lehtonen.An underrated part of this deal for the Stars is getting Johns along with Sharp. He is a promising young prospect on the blue line that figured to be a part of the Blackhawks roster this season given their salary cap crunch and the number of openings they were set to have on defense. He was originally drafted in the second round of the 2010 draft by the Blackhawks. He appeared in 51 games for Rockford in the American Hockey League this past season, recording 21 points (four goals, 17 assists).For the Blackhawks, it’s pretty incredible to see them move Sharp and Brandon Saad and still be in a position where they have almost no room under the cap. They did manage to get some quality NHL players back in return in both deals (and the Saad trade could prove to be a big one for them), but they still probably need to make another move (Kris Versteeg or Bryan Bickell if anybody would take his contract) to finish the roster.Garbutt has turned into a pretty solid depth player over the past couple of years, while Daley fills a spot on the blue line. Daley is coming off of a big year offensively, finishign with a career high 16 goals and 38 points in only 68 games, but he struggled at times defensively.So far this offseason the Blackhawks have lost Brad Richards and Antoine Vermete in free agency and traded Patrick Sharp, Brandon Saad and Stephen Jones.In return they have Viktor Tikhonov (free agency), Artemy Panarin (free agency), Marko Dano, Artem Anisimov, Trevor Daley, Ryan Garbutt, Jeremy Morin, and Corey Trop.